 Prevents and automatically regulates downstream pressure from exceeding set point. 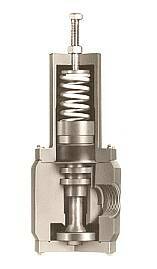  Designed to handle corrosive and ultrapure liquids with inlet pressure up to 150 psi at 75ºF.  Standard downstream pressure range for Series PR can be set at 5 to 50 psi; Series PRH can be set at 30 to 125 psi.  Poppet seat at valve orifice prevents sticking; double U-cup seals on internal shaft prevent inlet pressure from affecting the sensing of downstream line pressure.  Rolling diaphragm design assures sensitive operation.  Control spring is not in the liquid.  One-piece body construction eliminates internal leakage.  Body materials available include PVC, polypropylene, PTFE, PVDF.  Seals available in EPDM or FKM.  Inlet and outlet threads are FPT.